Winmate is presenting the Flat series Panel PC and Display, the special-designed system which provides better functionality and appearance. The complete flat screen reflects Winmate’s specialty in industrial and mechanical design. Since there is no gap on the surface, the product could avoid dust or liquid accumulation inside the gap. The FLAT series is not only easy to maintain and clean, but it is also slim and elegant. In the Flat series, Winmate is providing complete product lines, including the Projective Capacitive (P-cap) Panel Mount and the Resistive Panel Mount, for customers. The Winmate P-Cap Panel Mount is equipped with multi-touch solution, which has high standard accuracy, crystal clear resolution, and exquisite appearance. It also supports finger movements and specific gestures such as pinching (zoom-out), stretching (zoom-in), and swiping. 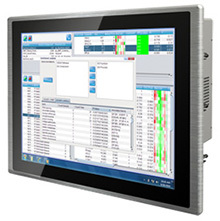 On the other hand, the Winmate Resistive Panel Mount provides a wider range of data creation methods. It allows users to interact with the system by finger, stylus, and any non-sharp object. Users could also operate the machine with gloved hands. The cost effective technology will ensure high-quality data entry under extreme environments.